Panasonic has developed a new technology, enabling electrical control of the near infrared (NIR) light sensitivity of the same pixel in an organic CMOS image sensor. This technology allows for switchning between modes of colour imaging and NIR imaging frame by frame, without the mechanical IR cut filter required for conventional image sensors. The sensitivity of all the pixels in the image sensor, which has directly stacked organic films, is simultaneously controlled by changing the applied voltage to the organic films. This technology also enables global shutter operation, the company says. Panasonic will present some part of these technologies at the international academic conference: ISSCC (International Solid-State Circuit Conference) 2017. 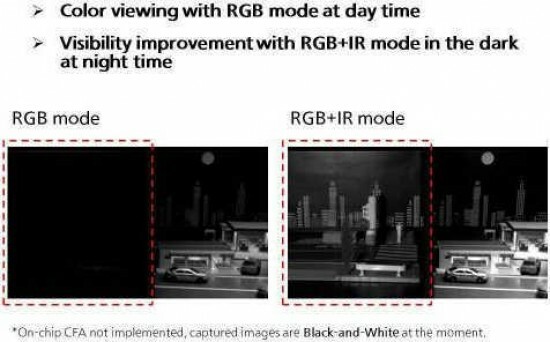 OSAKA, Japan -- (BUSINESS WIRE) -- Panasonic Corporation today announced that it has developed a new technology, electrical control of the near infrared (NIR) light sensitivity of the same pixel in an organic CMOS image sensor. The sensitivity of all the pixels in the image sensor, which has directly stacked organic films, is simultaneously controlled by changing the applied voltage to the organic films. This technology enables to switch between modes of color imaging*2 and NIR imaging frame by frame without a mechanical IR cut filter required for conventional image sensors. This contributes to miniaturizing a camera system and improving the robustness. This technology also enables global shutter operation*3. Therefore, it can be suitable for applications in various fields of industry such as machine vision or intelligent transportation system, in which fast and accurate inspection or recognition are necessary. Panasonic will present some part of these technologies at the international academic conference: ISSCC (International Solid-State Circuit Conference) 2017 which is to be held in San Francisco on February 5 - February 9, 2017.